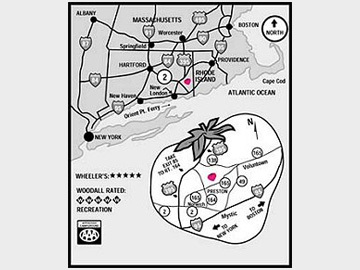 Strawberry Park is located in beautiful southeastern Connecticut, part of The Last Green Valley, almost halfway between New York and Boston, and just minutes from Mystic. We strongly suggest following the printed directions from many major cities that appear below the interactive Google map, as some navigation devices may direct you through downtown Norwich. While the highway route may be a mile longer, it is usually much faster. For those seeking computer assisted directions specific to your starting point, our exact address is: 42 Pierce Road, Preston, CT 06365. To use the interactive map, simply enter your starting address in the gray box below and click on “get directions” to provide specific directions from your home. In addition, you can access an aerial view of the campgound by selecting the “satellite” view. While you may not be able to see your own campsite through all the trees, you can see many familiar landmarks. (85 miles)—RT 90 (Mass Pike) West to Exit 10 (Auburn). I-395 South to Exit 22. Cross over RT 138. Left on RT 164 South. 4 miles to left on RT 165 East. Strawberry Park is 1 mile on left. (40 miles)—I-95 South to Rhode Island Exit 5A. 1 mile South on RT 102. Right onto RT 3 South for 1 mile. Right on RT 165 West. Strawberry Park is 17 miles, on the right. Note: Stay on RT 165 West, as it bears to the left and separates from RT 138 at the blinking light in Voluntown. (45 miles) —I-84 East to exit 55. RT 2 East to Exit 28 N. merge onto I-395 North Towards Providence take Exit 22 CT-164 Towards CT-138/Preston City/Pachaug. Turn right off exit onto RT 164 South. Go 4.4 miles turn left on RT 165 East. Strawberry Park is 0.8 miles on left. I-91 South to Exit 30 (left exit) onto I-84 East. Quickly move into right lane for Exit 55 onto Route 2 East. See directions following RT 2 from Hartford above. I-95 North to Exit 76 (LEFT EXIT). I-395 North to Exit 85. Right off exit onto RT 164 South. 4 miles to left onto RT 165 East. Strawberry Park is 1 mile on left. From New London, CT (transportation center/Orient Point Ferry—19 miles)—RT 32 North to I-395 North. Exit 85. Right off exit onto RT 164 South. 4 miles to left onto RT 165 East. Strawberry Park is 1 mile on left. (14 miles)—From Exit 90 off I-95 (Mystic Seaport Exit), take RT 27 North. Bear right at Mystic General Store. Continue to RT 184. Cross over RT 184 onto Lantern Hill Rd. Continue to right on RT 214, then left onto RT 2 West. Right onto RT 164 North at light after Foxwoods Casino. 3 miles to right on RT 165 East. 1 mile to Strawberry Park on left. (6 miles)—Left out of casino onto RT 2 West. 1 mile to right onto RT 164 North at light. 3 miles to right onto RT 165 East. Strawberry Park is 1 mile on left. From Mohegan Sun Casino: (12 miles)—I-395 North to Exit 22. Right off Exit 22 onto RT 164 South. 4.4 miles to left onto RT 165 East. Strawberry Park is 0.8 miles on left.